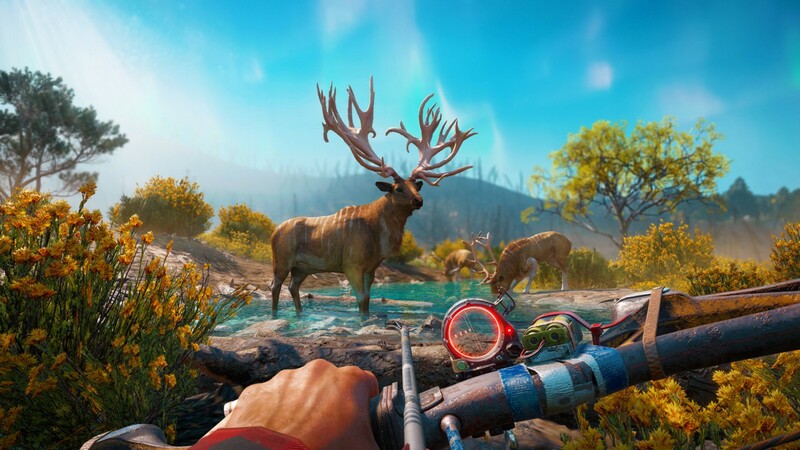 Far Cry New Dawn has been well received for the most part considering, its initial bugs and errors but UbiSoft has been adamant to fix these issues as fast as they could to keep their fan base and gamers happy and loyal. Keeping the campaign going, the studio has released a new patch (1.0.4) with comprehensive notes as to what it fixes and what’s new in there. The first official post launch patch brings a lot of fixes, mainly to missions, gameplay and some perks. Weapons of course are one of the main concerns when it comes to shooting games since a singular overpowering weapon can ruin the game for everyone and for those who use the perk, get bored after a while, so this time around the patch brings balance to all weapons, while the gameplay can explain things a bit better. • Fixed an issue where an entity would fail to spawn in an expedition. • Fixed an issue where the player can be stuck on a roof when parachuting during an expedition. • Fixed an issue where a note could disappear when playing in CO-OP. • Fixed an issue where a mission objective would not update under some conditions in a specific mission. • Fixed an issue where the player could push a NPC just before a cinematic. • Fixed an issue where the client’s camera could be stuck during cinematics. • Fixed an issue where some NPC would suddenly be hostile towards the player. • Fixed an issue where reinforcements would not spawn during a specific mission. • Fixed an issue where the player could be stuck in a black screen during a specific mission after triggering an event. • Fixed an issue where a specific mission would fail when the player entered a vehicle too early. • Fixed an issue where Carmina would fail to teach the player about the workbench when starting a second new game. • Fixed an issue where the whole game world could be covered in fog under certain conditions. • Fixed an issue where a specific mission could fail if the player took an enemy vehicle. • Fixed an issue where the player would be unable to complete a specific mission if some objects burned. • Fixed an issue where a dialog line was missing during a cinematic. • Fixed an issue where some dialog lines could be repeated twice in a specific mission. • Fixed an issue where dogs could be missing in cages in a specific mission. • Fixed an issue where a specific character could still be highlighted by Timber after being defeated. • Fixed an issue where a mission would not fail if a critical character died during a specific objective. • Fixed an issue where a character would not enter a helicopter after the completion of a specific mission. • Fixed an issue where the player could jump out of the arena and be unable to complete a specific mission. • Fixed an issue where a helicopter could spawn out of reach of the players during a specific expedition. • Fixed an issue where a splash screen would not be displayed at the end of a specific mission. • Fixed an issue where the player had to go through an extra loading screen towards the end of the game. • Fixed an issue where some Guns for Hire would pop out at the end of a specific cinematic. • Fixed an issue where a lightning flash was too intense during a specific cinematic. • Fixed a typo on a note located in one of the expeditions. • Fixed an issue where some vehicles could not spawn at the beginning of a specific mission. • Fixed an issue where the water would not lower if the dialogue was skipped during a specific mission. • Fixed an issue where an objective was skipped after a reload in a specific mission. • Fixed an issue where the windmill puzzle visual was not updating if the player moved away from it. • Fixed an issue where Hurk was getting out of the vehicle and blocking a specific mission. • Fixed an issue where it was possible to push an objective bag using the Wrath ability. • Added a tip to guide players towards the Home base’s helipad. • Fixed an issue where the player was unable to pick up a Baseball Bat at one location. • Fixed an issue where the player was unable to pick up a Med kit at specific locations. • Fixed an issue where unresponsive enemies could be found at a specific location. • Fixed an issue where some enemies could spawn inside a rock at a specific location. • Fixed an issue where some enemies could spawn under the ground during an Outpost reinforcement. • Fixed an issue where the user could be stuck in a black screen if an Outpost was completed while the player revived his Gun for Hire. • Fixed an issue where the Outpost name wouldn’t display during the celebration cinematic. • Fixed an issue where it was possible to have an intractable placeholder asset on the helipad. • Fixed an issue where the player was appearing in combat at the Black lung Mine fast travel point. • Fixed an issue where a Highwaymen flamer had a bad path finding. • Fixed an issue where driving control tips would not be displayed if the player spawned inside a vehicle. • Fixed an issue where the button prompt to track some animal pelts was missing. • Fixed an issue where the player was unable to equip upper and lower body items under certain conditions. • Fixed an issue where the amount of materials left would not be correctly updated after crafting a Med kit. • Fixed an issue where the player’s clothes would not change if he moved to another menu too quickly. • Fixed an issue where the default outfit would briefly appear on the 3D model when the player changed his appearance. • Fixed an issue where the player’s customization was not applied if the player used the randomization option too quickly. • Fixed an issue where some menus could become unresponsive. • Fixed an issue where the icon to find Timber would be missing from the map after acquiring the intel. • Fixed an issue where the ability to track a specific material would be unlocked after discovering a specific location. • Fixed an issue where a warning would still be red even with the colorblind mode active. • Fixed icon inconsistencies with some expedition rewards and some options in the interface tab. • Fixed a misleading message when attempting to upgrade weapons. • Fixed an issue where the ammo count in the Weapon Wheel would not update after purchasing ammo in the Home-base. • Fixed an issue where a freshness indicator would appear in the store menu after purchasing a piece of clothing. • Fixed an issue where mission specific outfits could be unequipped when entering the clothing store. • Fixed an issue where the grapple icon would still appear even if the player turned off the HUD. • Fixed an issue where the weapon’s highlight in the workbench would remain in other menus. • Fixed an issue where a button in the In-Game store would not restore the connection to said store. • Fixed an issue where the highlight of a category in the workbench would disappear if the player pressed two buttons simultaneously. • Fixed an issue where the menu selection’s highlight could disappear when changing tabs. • Fixed an issue where the clothing icons could revert to default in the character menu. • Updated the description of a perk to reflect all of its functionalities. • Fixed some discrepancy issues between the display of the 3D models of some flamethrowers in the shop and the weapon workbench. • Fixed an issue where a weapon thumbnail was mismatched with the workbench. • Fixed an issue where it was possible to have an empty menu after a Far Cry services error. • Fixed an issue where the upper body customization thumbnail was mismatched while wearing the Space Ape outfit. • Improved fog and cloud effects in the expedition Alcatraz Island. • Updated the Unicorn Flamethrower thumbnail in the Premium shop. • Fixed an issue where Facial hair, head-wear and gloves icons were still showing in the customization menu after being unequipped. • Fixed an issue with the scavenge pop-up that was not appearing under certain conditions. • Fixed an issue with the Talk prompt that was displayed during the cinematic transition screen. • Fixed an issue where the outfit icon was not displayed if the player equipped each piece one by one. • Fixed an issue with Timber’s health bar being offset while driving a car. • Fixed an issue where some door sound effects would be looping under certain conditions. • Fixed an issue where helicopter sounds would keep playing in some cinematics if the player was piloting that vehicle. • Fixed an issue where some music could keep on playing if the player disconnected his controller during certain cinematics. • Fixed an issue where sound effects could be muffled after re-spawning during a specific mission. • Fixed an issue where a radio call would be repeated twice. • Fixed an issue where water splash was heard outside of water if a 4 cab was moving underwater. • Fixed an issue where players were losing part of the sounds after disconnecting their controllers during an expedition. • Fixed an issue where a button would trigger multiple actions when driving with the “Shooter” control configuration. • Fixed an issue where a bag would not grant the loot inside of it. • Fixed an issue where the Guns for Hire’s command icon would still be displayed on Elite enemies even when they are not visible. • Fixed an issue where throw-ables were misplaced in the player’s hand while driving a specific vehicle. • Fixed an issue where the Wrath effect would not stop when the player was in downstate. • Fixed an issue where the number of kills for Guns for Hire doesn’t match between the Challenge tab and the Roster tab. • Fixed an issue where some vehicle textures could be missing under some specific conditions. • Improved rag-doll reaction against some vehicle types. • Fixed an issue where weapons were disappearing after the Outpost celebration cinematic under certain conditions. • Adjusted melee damage of some of the shovels. • Fixed an issue where some ammo would be missing upon reloading. • Fixed an issue where a visual effect could be stuck on some sniper rifles when picked up by the player. • Fixed an issue where the AJM9 – Blood Dragon highlight was being seen through the host body. • Fixed an issue where the rumble effect was missing when holstering and un-holstering the Saw Launcher. • Improve the visual of the Re-curved Bow – Blood Dragon in Photo mode. • Fixed an issue where NPCs was getting hurt by the flame from the flamethrower while in Photo mode. • Fixed an issue where some glow effects were very bright in expeditions when changing the time of the day. • Fixed an issue where Guns for Hire would stop being highlighted if the player revived them in water. • Fixed an issue where the player could still find old animal models in the wild. • Fixed an issue where Carmina could drop her weapon when she died. • Fixed an issue where the Highwaymen & Survivor NPCs had a sniper weapon attached during binocular animation. • Fixed an issue where the Spanish subtitles would not match the dialog in a specific scene. • Fixed an issue where the voice-over button would be displayed on the difficulty selection screen when playing in languages other than English. • Fixed an issue where a trophy would not trigger for the client after completing the requirements. • Fixed an issue where a trophy was triggered too early. • Fixed an issue where the player could encounter an infinite black screen while playing in CO-OP during some specific missions. • Fixed an issue where the client would spawn in a bad sector when joining the host under some specific conditions. • Fixed an issue where the client could trigger a vehicle booby trap when spawning in a helicopter. • Fixed an issue where the client’s health would not fill up after upgrading the infirmary. • Fixed an issue where the splash screen could be stuck on screen when playing treasure hunts in CO-OP. • Fixed an issue where the client was not restricted by the host’s workbench level when attempting to craft weapons. • Fixed an issue where expeditions could not be unlocked when playing in CO-OP. • Fixed an issue where pill bottles could be highlighted and visible through the host’s body. • Fixed an issue where expert level expeditions would not be counted as completed for the client. • Fixed an issue where the player could end up being unable to finish a specific mission if the client died during one of the objectives. • Fixed an issue where the client would spawn out of the world after dying during a specific mission. • Fixed an issue where the host and client would be stuck in a black screen if they triggered a mission under some specific conditions. • Fixed an issue where a player’s tag would overlaps with some text in the workbench store. • Fixed a replication issue with the World Map. • Fixed an issue where it was possible to see Joseph in T pose near the New Eden compound while playing in CO-OP. • Fixed an issue where completing expert difficulty expeditions were not count toward the client. • Fixed an issue where some parts of the semi-legendary vehicle were disappearing upon connection in CO-OP. • Fixed an issue where one of the players could get teleported out of the radiation zone while using an inflatable boat. • Fixed an issue where the camera for the client was misplaced after getting up from the ground in a cinematic. • Fixed an issue where it was possible for the client to lose the consumables visual from the combat supplies sections. • Fixed some stability issues caused by general gameplay. • Fixed some stability issues caused when client connects to the host to play in CO-OP. • Fixed a stability issue caused by approaching certain locations while the CO-OP partner is in spectator mode. • Fixed a stability issue caused by breaking windows during a specific mission. • Fixed a stability issue caused by some menus during a specific mission. • Fixed a stability issue caused by jumping in a water tank too early during a specific mission. • Fixed a stability issue caused by the character customization menu. • Fixed a stability issue caused by Photo mode. After reading the entire list, make sure you download the patch and run the game at least once before swapping it with something else, or deleting it from your library for good. Ubisoft may not be a fan favorite these days but the patch notes show you how the team has been working to make the experience worth your purchase.